A very popular label material with a wide range of applications. The label material has an acrylic based permanent pressure sensitive adhesive, with some moisture/water resistance. 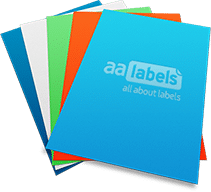 The label face-stock is an attractive bright metallised silver and is therefore not suitable for use water based inks and Inkjet printers, but can be printed using thermal transfer. The material is used extensively in commercial, product packaging and retail applications. Other silver materials in paper face-stocks are also available and can be viewed in the “Other Materials” section, or by searching using the 3 filters shown below.